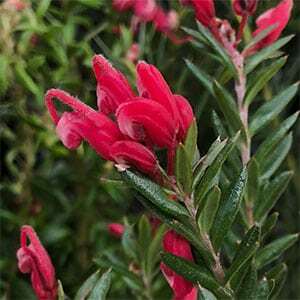 With brilliant red flowers and a dense bushy growth habit, Grevillea ‘Poorinda Rondeau’ is a hybrid between G. lavandulacea and G. baueri. Flowering mainly in spring, however in both winter and summer spot flowering usually occurs. The foliage is a deep mid to green, tightly clustered along the stems and new growth is tinged with bronze. A natural compact growth habit makes it one of the best ‘Poorinda’ cultivars. 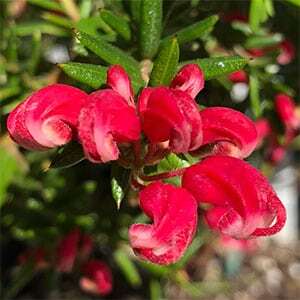 In temperate climates this is an easy care variety. It requires a well drained soil and good sunny position. Light pruning after flowering will help maintain a good bushy habit. Soil – Best suited to areas that are damp, beside streams, seepage zones and even coastal areas. Will grow well in most soils. Flowers – Deep red flowers in spring.